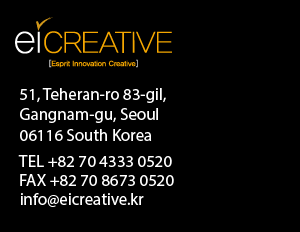 We are an international design company in Seoul, expertise in MICE (Meetings, Incentives, Conferences and Exhibitions) industry. Owner-managed unaffiliated and independent. We have supported brands, companies and organizations in the areas of strategy, branding, experience and motion for over 15 years. Our label stands for top quality design and unique brand experience whether analogue, digital or virtual. Since 2017 our business spectrum is getting wider and further. Based on our rich experiences in spatial design, we provide interior design, remodeling and construction management directly to customers in Korea. We use the power of brand experineces in presentations, sales and services. We bring products and services to life. Analyses, measurese and strategic foundation for spatial design. We provide practical and reasonable solutions right to customers. Hyundai Corp. KOTRA Fursys Inc. Have &Be Co.
Samsung Corp. Sebang Co. Intromedic Co. Tamron Co.
Eicreative Design Studio it is our creative hub, where we host, welcome and accomodate our clients, partners, emploees, and colleagues. We hold casual and comport meetings where we share our snacks and coffee together.